In 1864, the first park in Indianapolis opened after Governor Oliver P. Morton donated the land now known as Military Park for use as a recreational area. 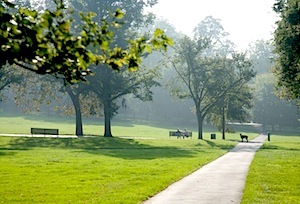 Today, Indianapolis is home to some of the nation’s finest parks and greenways. More than 100 years ago, forward-thinking officials hired George E. Kessler, a city and park planning expert and landscape architect from St. Louis, to design the Indianapolis Park and Boulevard System. Mr. Kessler studied botany, forestry, landscape design and civil engineering in his native Germany, and then returned to the United States in 1892 to pursue his livelihood. Mr. Kessler’s impressive career spanned 40 years, where his work and legacy spread through 100 cities across 23 states, Mexico and China. He worked on more than 230 projects including plans for cemeteries, communities, park and boulevard systems, estates and residents, fairgrounds, parks, and schools. The Indianapolis Park and Boulevard System was listed on the National Register of Historic Places in March 2003. The city now offers an extensive greenway system, with several trails completed and more under development. A greenway is defined as a corridor of undeveloped land, as along a river or between urban centers, that is reserved for recreational use or environmental preservation. A blueway is a water path or trail developed with launch points, camping locations and points of interest for canoeists and kayakers. Blueways are typically developed by state, county or local municipalities to encourage family recreation, ecological education and preservation of our wildlife resources. Spring has sprung and summer is just around the corner. No matter where you live, a park or greenway is not far away. Come out and enjoy what our beautiful city has to offer.